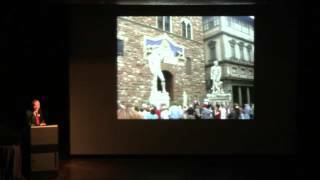 This lecture was presented by Julian Brooks, curator, Department of Drawings, J. Paul Getty Museum on October 30, 2015 in conjunction with Michelangelo: Sacred and Profane, Masterpiece Drawings from the Casa Buonarroti, on view at the Frist Art Museum from October 30, 2015–January 6, 2016. Dr. Brooks studies the arc of drawing across Michelangelo’s long career, with particular regard to his distinctive choices of black chalk, red chalk, and pen and ink, and his mixed use of them. Setting the works in Michelangelo: Sacred and Profane, Masterpiece Drawings from the Casa Buonarroti in context, the talk delves into the mind of one of the Italian Renaissance’s great creative voices.